Writing is one of those things that homeschoolers often worry about teaching. It can be difficult to evaluate writing as it can be so subjective. Throughout my years of homeschooling I have taught writing both using a homeschool writing curriculum, and not using any curriculum at all. Teaching without can feel a little like being a fish out of water, flopping around with no direction or purpose. 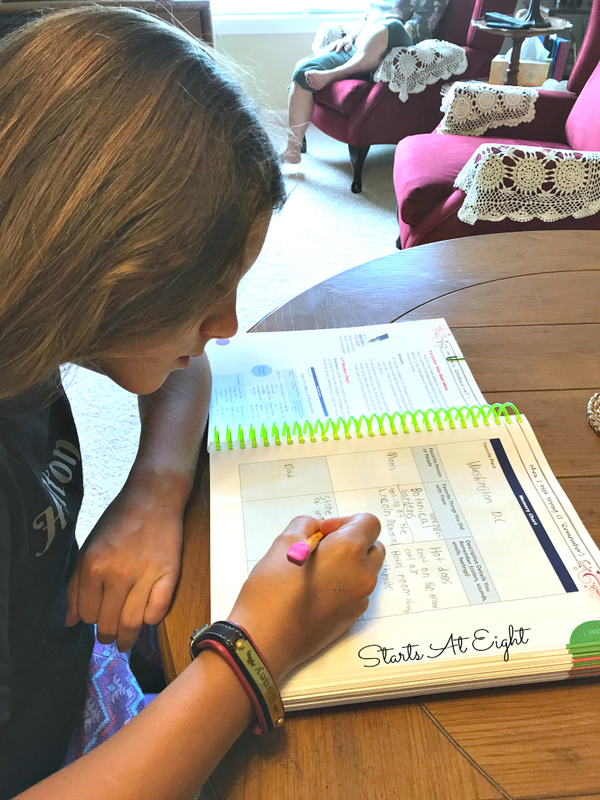 On the flip side, finding a good homeschool writing curriculum that can make you feel confident about teaching and evaluating your child’s work can also be quite a challenge! If you saw my recent review of Apologia’s Readers in Residence you know that these two curriculum options “had my daughter at hello.” She loved the covers and the vibrant colors! While this alone doesn’t make it a fabulous curriculum, it did get her in the door! 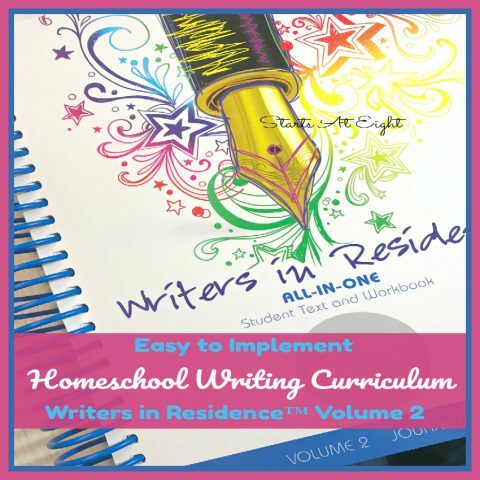 Apologia’s Writers in Residence homeschool writing curriculum is designed for kids in grades 4-8. 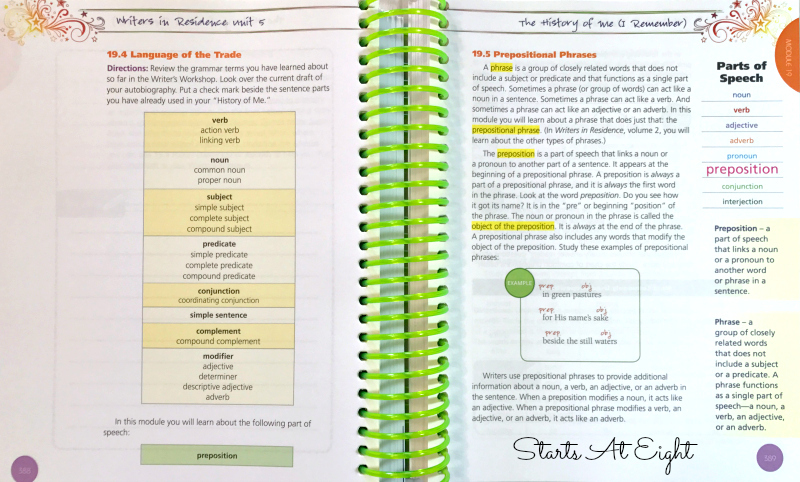 While your child completes various writing assignments, they will also grow their vocabulary, learn about sentence structure, the parts of speech, and the conventions of the English language for punctuation, capitalization, and usage. We are using both Readers in Residence and Writers in Residence for 6th grade this year. The two of these programs together provide a full year of language arts. Want an up close, in-depth look so you can see it for yourself? Here you can find a LARGE (100+ page ) SAMPLE of it for you to check out! While you’re there, be sure to pick up a FREE Eclipse Activity E-book the whole family can use! Writers in Residence is broken down into 6 chapters with 4 different modules in each chapter. 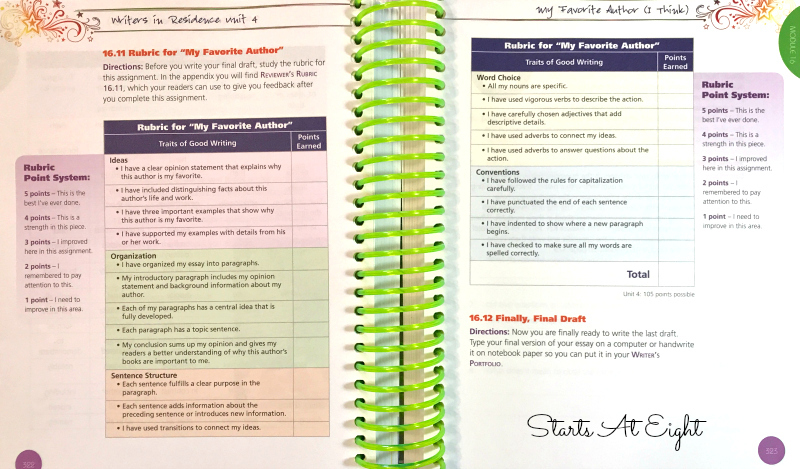 Each unit focuses on a different style of writing and uses a real life writing example to help teach the concepts required for that style of writing. At the end of each chapter there is a Spotlight on Christian Writers section. Each of these sections features a different Christian writer in which they answer questions about how they became a writer, where/when/how do they write, where they get their ideas, etc. These are a great chance for kids to get inside the brains of seasoned writers and possibly learn a thing or two that might help them along the way! Just as we saw with the Readers in Residence, Writers in Residence has a 32 week, 4 day a week schedule built in! This makes my life so much easier! No planning it out, no trying to figure out how much is too much for one day! Just open and go! Plus I love that they do it over 4 days because it builds in a breathing day for a break, a hiccup in your week, etc! Since we are doing both programs together I was trying to decide how that was going to work. I feel like there are two ways to do it. The first is to double down on lessons each week and just do one of the programs for half the year, and the other program for the other half of the year. The second way (which is what we are doing) is to do the programs simultaneously, following the suggested schedule. They are different enough to keep it interesting, but similar enough to do them side by side! 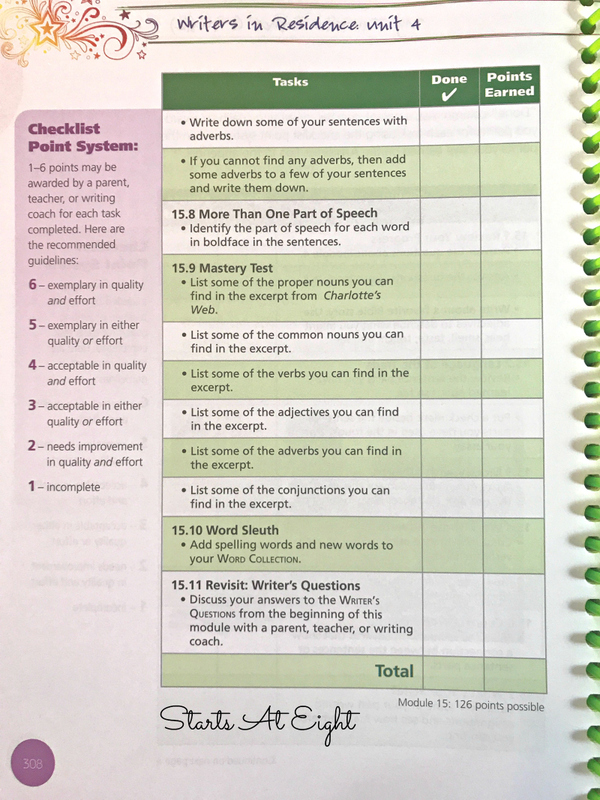 Within each of the 6 units there is a grading rubric to help you as the parent to evaluate your child’s work, and assign a grade. 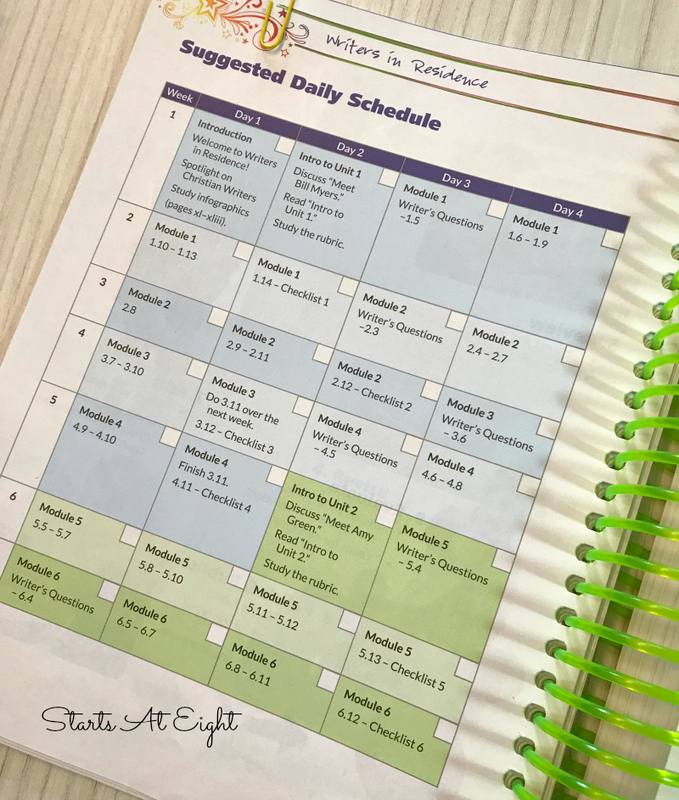 Within each module there is a checklist of tasks to help keep your student on task along the way. I like this because it allows my daughter to be accountable to her first, before she hands it over to me for review. There is no wondering what she did or didn’t complete, or what she needed to do to be finished. Writers in Residence uses lots of quality literature to model the concept/skill it is teaching. I LOVE that they incorporate this not only into the curriculum, but into the text! 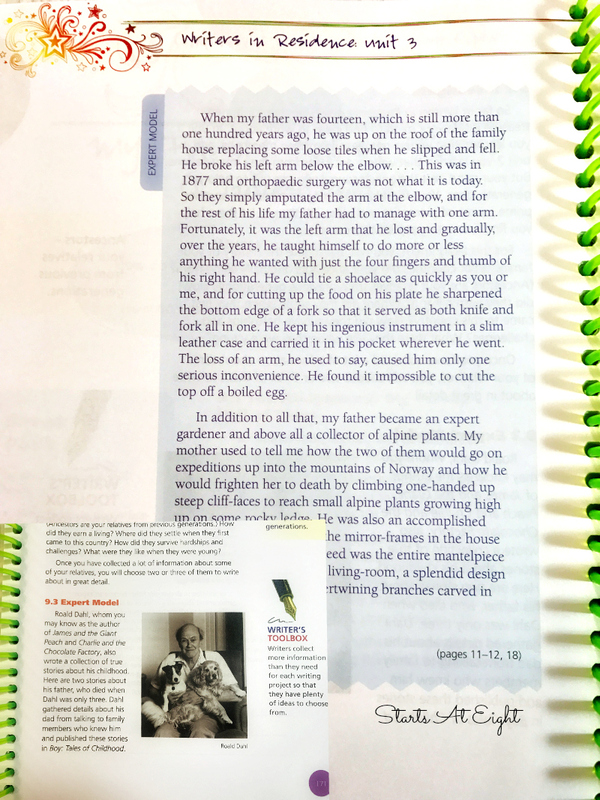 This means that the examples are right inside the students work/textbook so there is no hunting for other books! 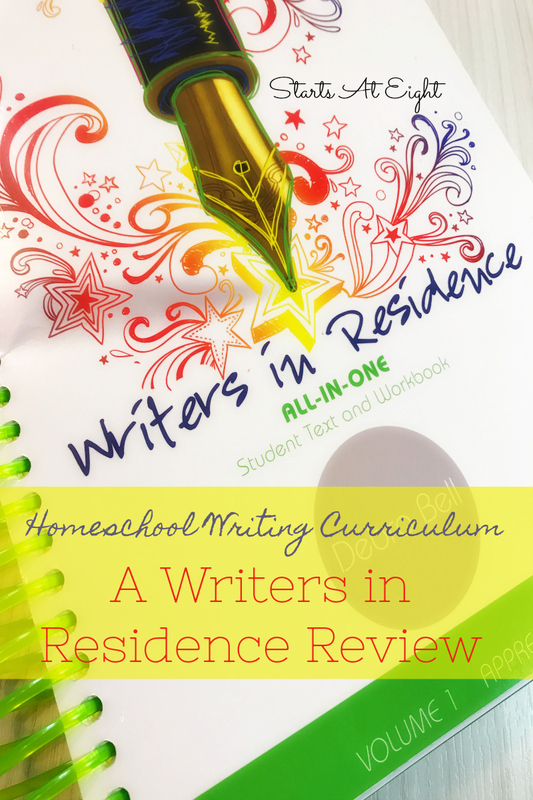 If you are looking for a well planned out homeschool writing curriculum that helps you to evaluate your student’s writing while also allowing them to work independently, then Writers in Residence is for you! We are so exited to be using this as part of Our 6th grade Homeschool Curriculum this year! If you love Writers in Residence like we do, Apologia now has Volume 2 out! (There are a total of 4 planned) You can check out my review and get an inside look at Writers in Residence Volume 2.